What’s the one food you crave more than anything else? The food you wake up thinking about, go to bed dreaming about, and pretty much go about your business 24 hours a day craving? I’m guessing lots of people would say pizza. I mean, how many foods can claim they are featured on everything from bedding to underwear to jewelry. Well, maybe hamburgers could make an argument for themselves, too, but I’m still giving the prize to pizza. But for me? It’s meatballs. With probably nachos trailing very closely behind (come to think of it, how have I never thought to make meatball nachos before?). You probably won’t find a comforter featuring meatballs and wearing a meatball necklace may be a sign you have an issue or two (though, um, they do exist). I’m not even going to touch the underwear concept. Anyway, for some reason, meatballs always sound like a good idea to me and I’d probably eat them for every meal if possible. Sooo, meatballs on pizza? The only thing that could possibly rival that is meatball nachos or meatball tacos (coming soon… to my life!). I have a trusty flatbread dough recipe that I’ve been working on perfecting for years (originally from Artisan Bread in 5 Minutes a Day, but tweaked quite a bit since then). Sometimes I do things like add bacon to it and sometimes I add basil. This time, I added parmesan cheese and cracked black pepper for a little kick. You’ll need to plan a little bit ahead because the dough will need about 2 hours to rise. I also whipped up a batch of meatballs. 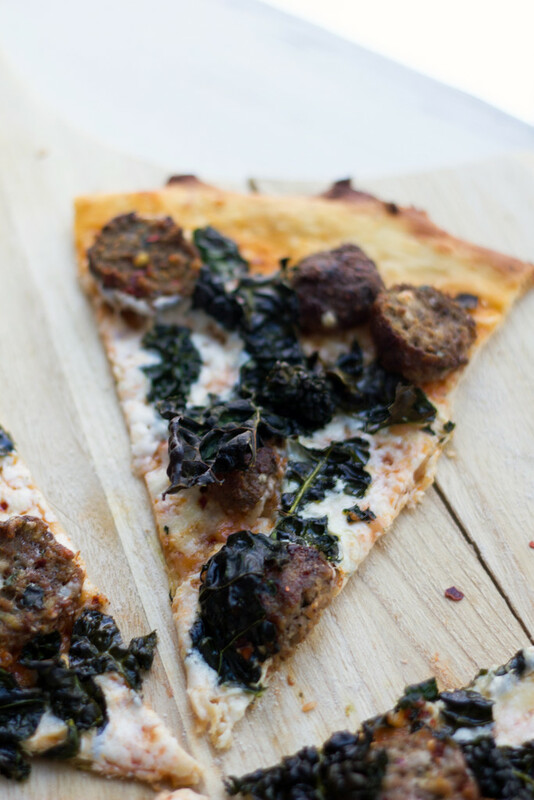 My recipe makes double the number of meatballs needed for these two flatbreads, so you could halve it if you want… But I included the full recipe here because I guarantee you’re going to be eating them while you make the rest of the flatbread. Plus, meatball sub, anyone?? 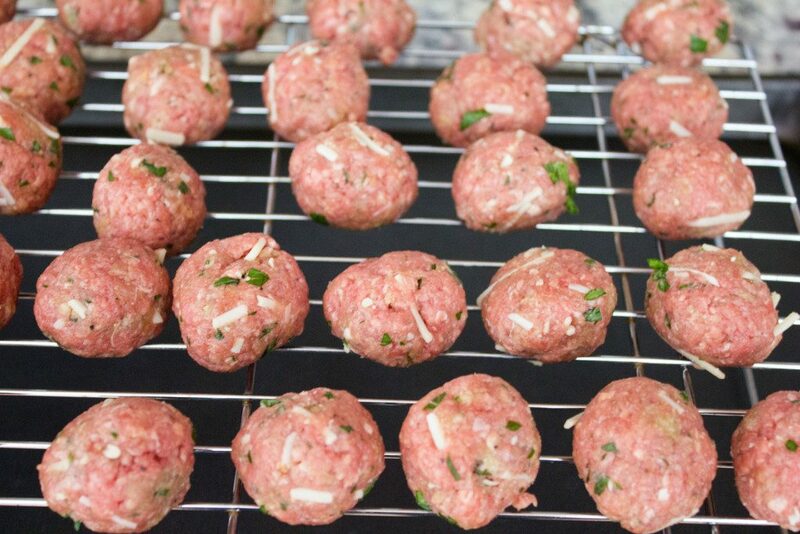 Hi, do you realize how easy it is to make meatballs? Basically, put all the ingredients in a bowl and mix together. Roll mixture into meatballs. You’ll get about 30 with this recipe. And then fry them in a skillet with olive oil, until cooked through. You’ll want to slice them up for the purposes of this flatbread. 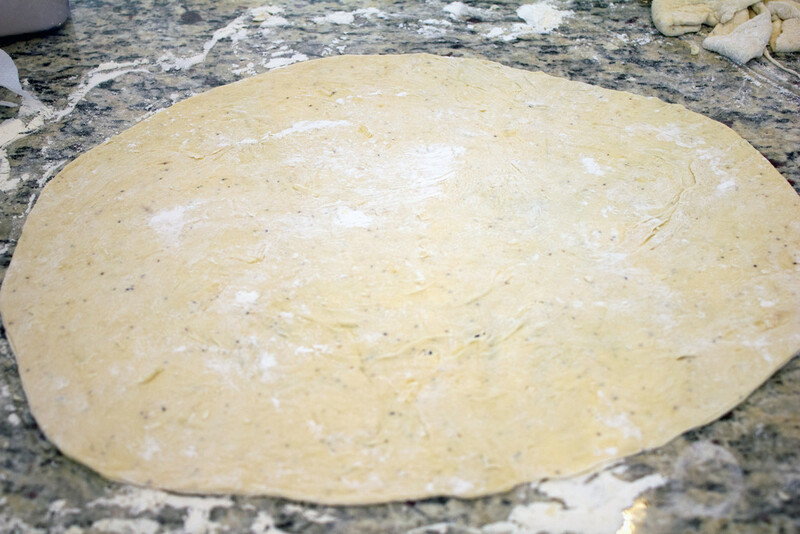 Once dough has risen, divide it into two pieces and roll into two thin, 10-inch rounds on a lightly floured surface. Add the toppings on, making sure to divide in half, so you can load up both flatbread doughs. Start by brushing the olive oil over the top and sprinkling on the garlic. Then lightly spread tomato sauce over dough and top each round with fresh mozzarella and shredded cheddar cheese. 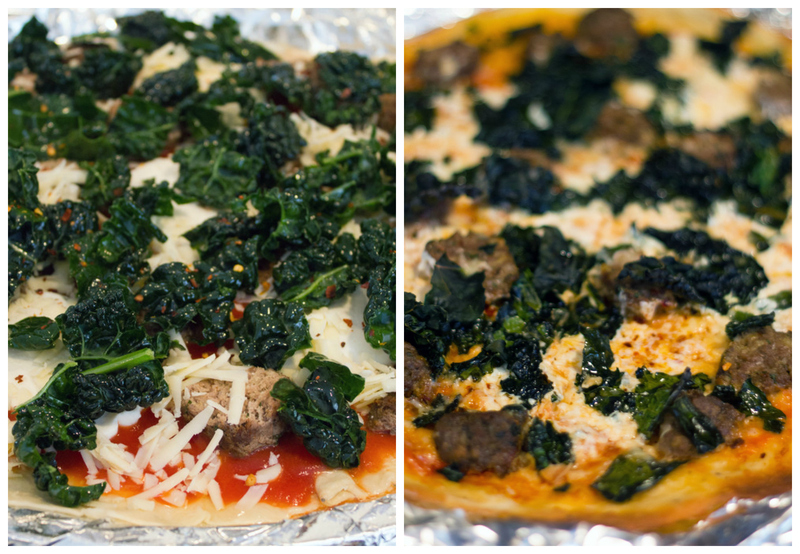 Top with about 15 meatball halves and sprinkle kale leaves over the top. Bake at 450 degrees for about 10-13 minutes until crust turns lightly golden. Cooking time will vary based on how thick the dough is. 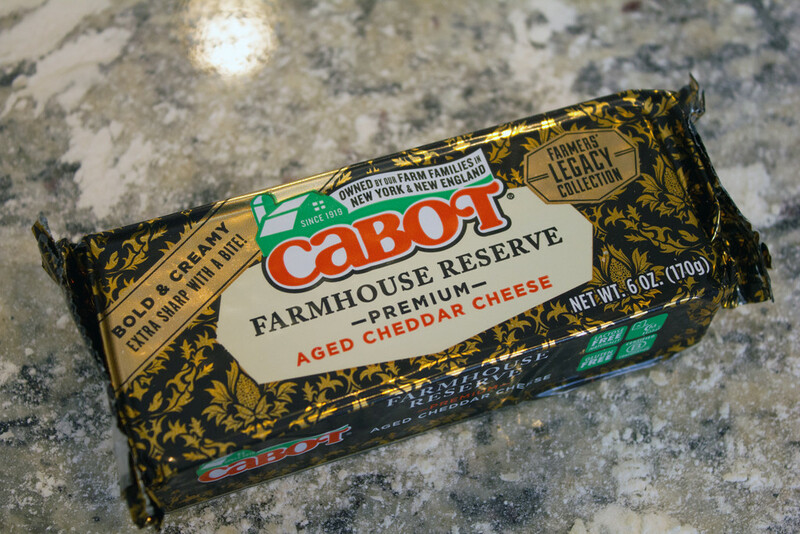 In case you’re interested, I used Cabot’s Farmhouse Reserve cheddar cheese, one of my all-time favorites. Bold and creamy (like it says on the package) is the perfect way to describe it. And tuscan kale! Also known as lacinato kale. Or dinosaur kale! I can’t get this in my normal grocery store, but found about a billion varieties of kale at Wegmans and basically cried when I saw lacinato kale. My meatball craving has officially been satisfied. For at least a night or two. But honestly, I loaded these flatbreads with so many meatballs that I practically had a slice in every bite. This is my own personal heaven. I can’t even tell you how long it’s been since I put a red sauce on a pizza… Forever? I only added a touch to this flatbread, but it was the perfect amount. Meatballs totally call for tomato sauce, but I prefer my flatbreads to be more cheese than sauce. The mild mozzarella and sharp cheddar played together very nicely here. And the kale? 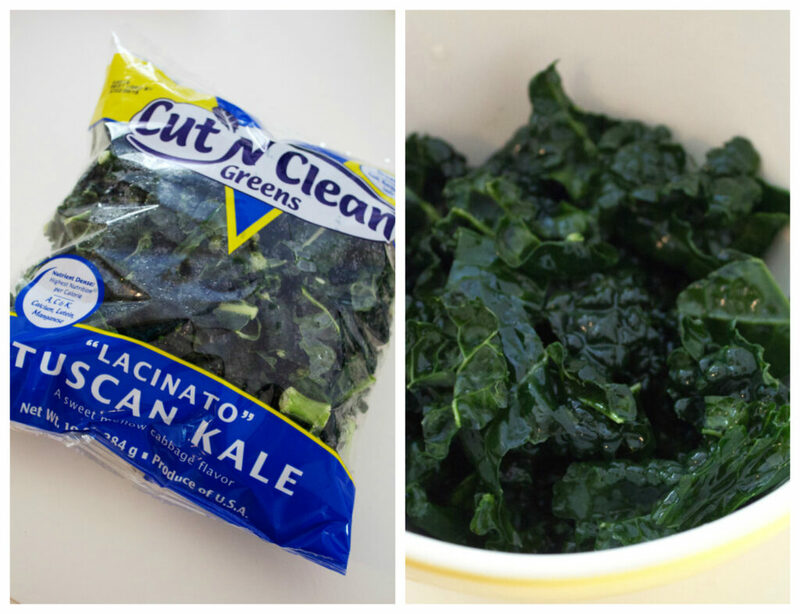 Tuscan kale is officially my new favorite! Look how dark and beautiful it is. It’s also a little bit less bitter than the typical kale, so it’s a good “gateway kale” if you ask me. That crust? Perfectly golden. I LOVE a thin crust pizza, which is why I often focus so much on flatbread. I think I secretly like it so much because it means I’m allowed to eat so much more of it. I’m a full believer in multiple pizza nights in a week, so long as you’re making the pizza yourself. You can completely control the ingredients and you can have a completely different meal every night… Just on pizza dough. Now I’m going to need those bedding people to get on making a set of meatball flatbread sheets. Is that really too much to ask? What’s the food you crave most often? Would you put it on pizza? 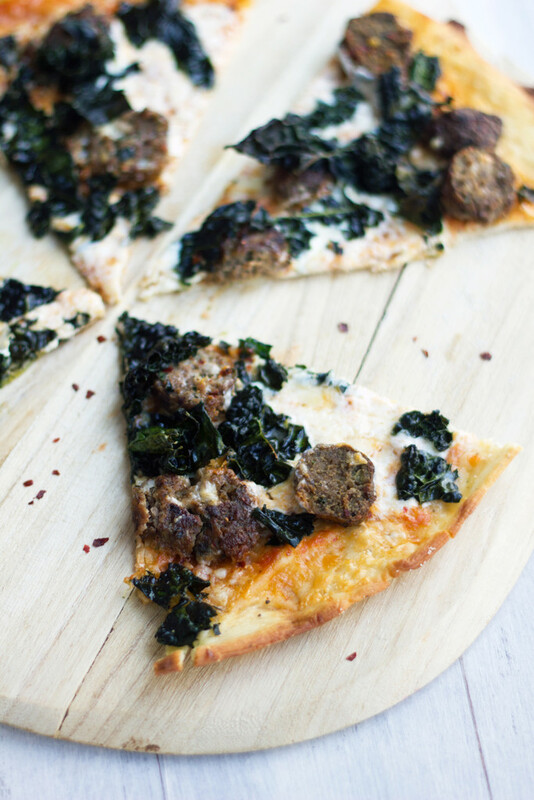 This flatbread combines some of my very favorite foods into the ultimate meal. The meatball recipe will yield double the amount of meatballs necessary for these two flatbreads, but I still recommend making an entire batch for snacking purposes. Divide dough into two portions and roll into two 10-inch rounds on a lightly floured surface. Brush 2 T of olive oil on each dough round and sprinkle garlic around. Spread 1/4 C tomato sauce on each dough round and top each with 3 oz. fresh mozzarella cheese and 1/2 C shredded cheddar cheese. 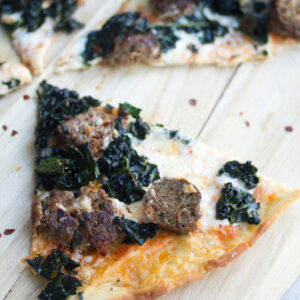 Slice meatballs in half and top each flatbread with about 15 meatball halves. Bake flatbreads on pizza stones or foil-covered pans at 450 degrees for about 10-13 minutes, until crust is golden. Gently knead parmesan cheese and cracked black pepper into the dough mixture. 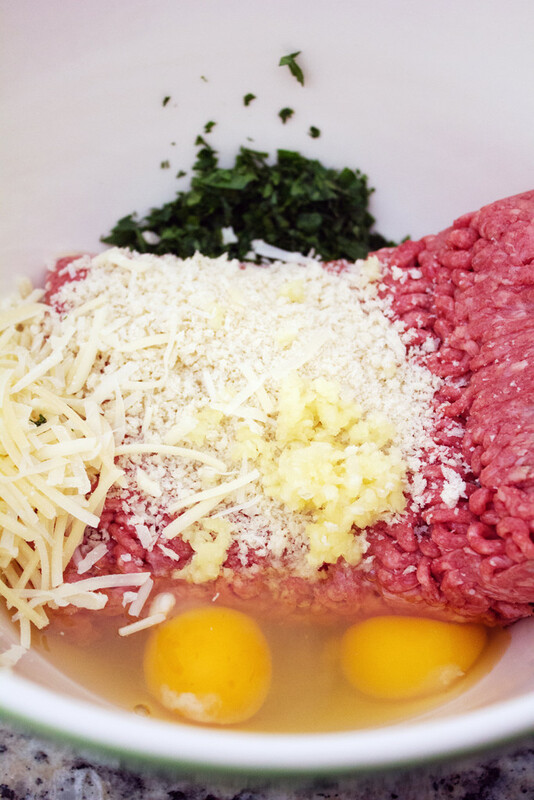 In a large bowl, mix together ground meat, panko, minced garlic, parmesan cheese, eggs, chopped parsley, and salt and pepper. Using your hands, form about 30 mini meatballs. 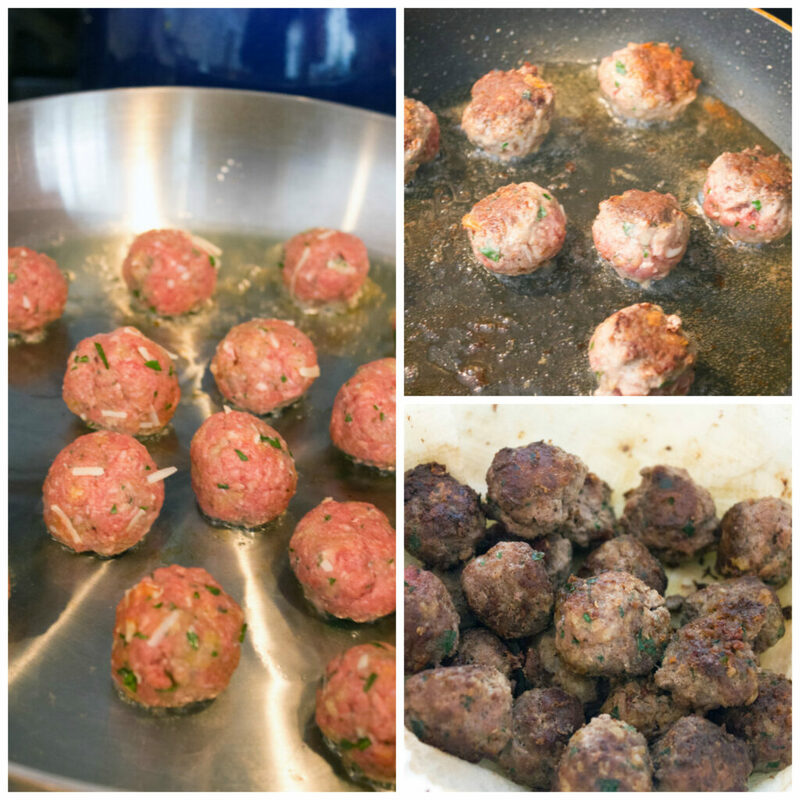 Pour olive oil into a skillet over medium heat and fry meatballs for about 10 minutes, until browned and cooked from the inside. Place cooked meatballs on a paper towel-lined plate. 23 Responses to "Meatball Flatbread with Parmesan Peppercorn Crust"
Definitely one of my favorite flat breads. So good! I feel similarly about my eggplant version of meatballs…so I totally get you on this!! I could eat them on everything…but HOW HAVE I NOT PUT THEM ON PIZZA?! I feel like I’m living a deprived existence now. 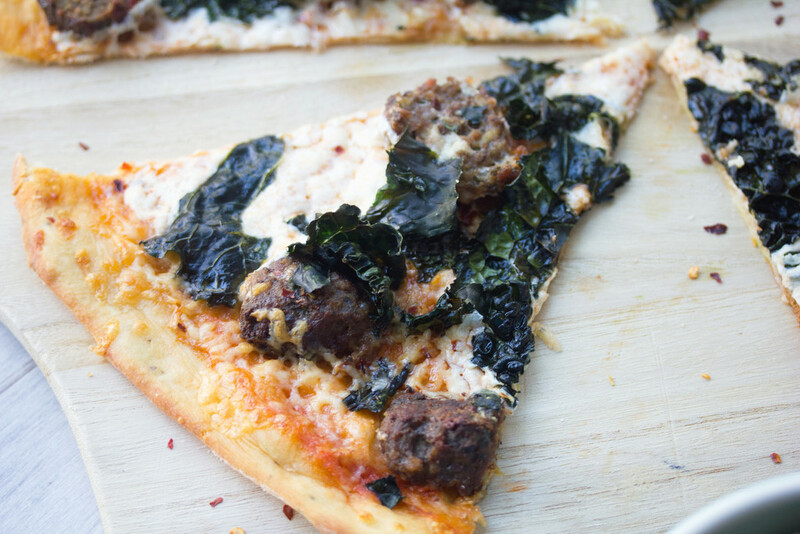 Meatballs are one of Matt’s favorite foods… in fact he always chooses meatball pizza over anything else. Winner recipe for sure! Wow this looks amazing, Sues! I love that parmesan peppercorn crust. Totally craving this for breakfast right now! wow. Clearly I need to be putting meatballs onto my pizza more often. This looks incredible. I’m definitely craving this right now! Love pizza of course and adore the crispiness of thin flatbread. The topping looks delicious! Oh wow this pizza is totally screaming my name….screaming!!! 🙂 SO delicious looking!!! you’ve done it again. i think everytime i see what food you’ve posted i find myself hungry and my mouth watering. this is a delicious flatbread recipe! Meatballs AND pizza? This is my kinda dinner! YUM!!! I love meatballs so so much too and now totally craving them! That crust! Those meatballs! OMG everything about this sounds amazing! Love the looks of your flatbread, Sues. Great recipe and you turned out a beautiful pizza. I’m not a huge fan of red sauce so like your sparing use of it here. Using kale another great idea. This looks delicious! Yes yes yes!!! I love this! 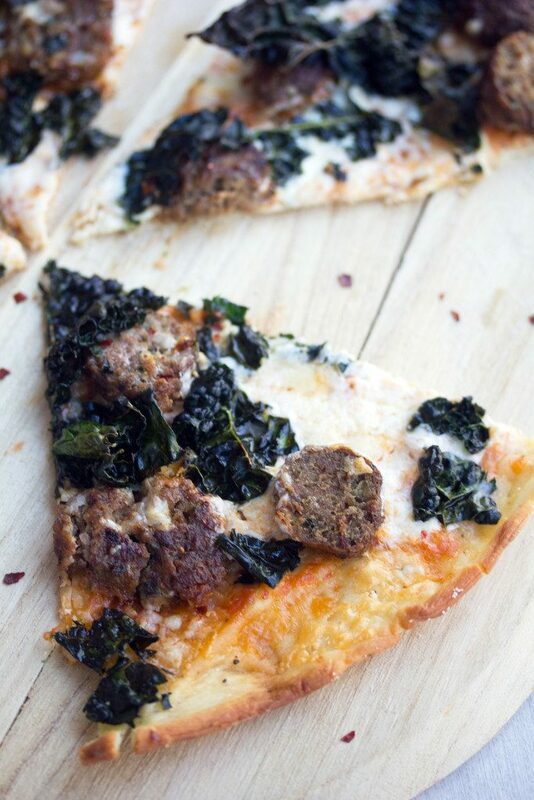 That parmesan peppercorn crust looks so good and topping it with kale and fab meatballs is such a good idea! whoa…i’m in love with this crust. awesomeee! That crust looks so crispy! 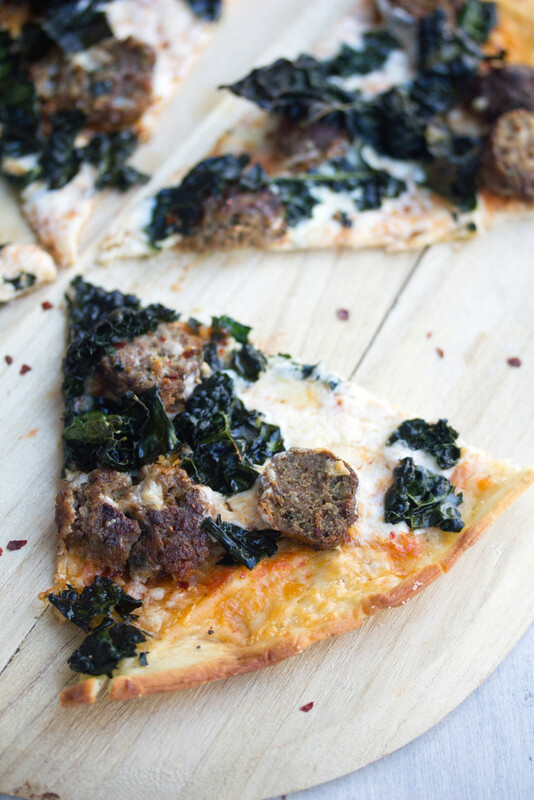 I’m a big fan of meatballs, so I’d be all over this with multiple slices! Now I’m seriously craving meatballs! What a great idea to put them on a pizza style flatbread too! The crust sounds delicious. Your post made me laugh. I am not that big of a nut about pizza, but I sure am about meatballs. So this a mighty fine pizza in my book! Delicious ‘do’ on the meatballs by the way.